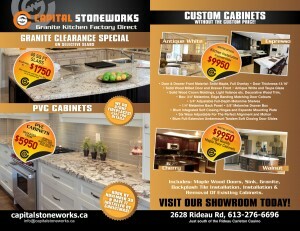 We have the best prices on granite countertops and kitchen cabinets in the Ottawa and surrounding area. Factory direct pricing on granite countertops, Caesar stone and kitchen cabinets. Is this a new install or a repair? How old is your Kitchen / Bathroom / flooring? Did we do any previous repair or the install? Did you previously receive any quote from us?